Geometry helps us make sense of the world about us. Shapes and their motions actually define the space we live in. Geometry also helps us learn more about other areas of mathematics such as number, algebra, and measurement. In Exploring Shape Games: Geometry with Imi and Zani students explore 2-dimensional shapes and in doing so discover properties of these shapes rather than memorize definitions given to them. The reasoning and spatial sense skills that they use help them develop an understanding of the properties of shapes, the relationships among shapes, symmetry, and congruence. Chapter 1 explores composing and decomposing 2-dimensional shapes. The mathematically correct names of polygons are presented and students focus not only on the number of sides of shapes, but also the number of vertices. Chapter 2 focuses on describing, sorting, and classifying shapes by their attributes such as sides, angles, shape, color, and size. Chapter 3 investigates congruency and symmetry of 2-dimensional shapes. 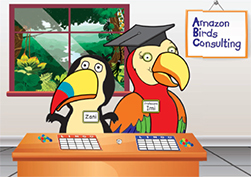 Throughout the unit students are involved in testing out geometry games for Imi and Zani, a macaw and Toucan from the Amazon Rain Forest. Students play games such as Groupo, MOVE It! REMOVE It!, The One-Loop Game, Carroll Diagram Puzzles, and Match It Up and then provide feedback to Imi and Zani. Young students use measurement concepts and processes in their everyday lives as they explore the world around them at home, at school, and in their community. They wonder how heavy a box of toys is, how big the playground is, and how long their new classroom pet snake is. And this is just for starters! Thinking and acting like mathematicians, they can answer all these questions over time as they come to understand the concepts of measurement and the skills involved in the measurement process. Chapter 1 focuses on the attribute of weight. Young students think about weight as “how heavy an object is.” Students will gain experience with comparing a variety of objects of different weights and determine which is heavier, lighter, or are they about the same. Chapter 2 involves measuring area, using square inch tiles, and making comparisons. Students experiment with covering a variety of surfaces to discover that they must use the same unit repeatedly or numerous identical units and that they must cover the surface completely with no gaps or overlaps. Chapter 3 focuses on length, an attribute which involves a complex set of measurement processes and concepts. Students will compare and order lengths, learn how to measure with the standard unit of an inch, and create an inch ruler. 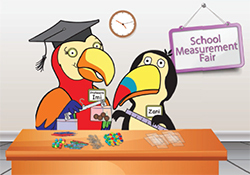 Throughout the unit students work with Imi and Zani to prepare a School Measurement Fair. Number sense is the heart and soul of elementary mathematics. In fact, Fennell and Landis (1994) state that number sense is “the foundation from which all other mathematic concepts and ideas arise.” In general, number sense means that students know how to make sense of numbers, how to use them, and to see relationships among them. This gives them the ability and confidence to make and solve a variety of problems. In this unit, Exploring Number Games: Making Sense of Numbers with Imi and Zani, students gain a deeper understanding of numbers by focusing on important overarching concepts: multiple representations of numbers; the size and ordering of numbers; place-value concepts focused on tens and ones; patterns with skip counting; and odd and even numbers. They gain flexibility in their thinking by sorting and classifying numbers using Carroll diagrams and Venn diagrams. All the investigations in the unit aim to broaden students’ understanding of numbers by helping them make sense of numbers. Chapter 1 introduces students to how numbers are used in everyday life and how numbers can be represented in a variety of ways. They compare numbers to determine which number is greater or less than another number. This is all done in the context of creating a “kid number line” and playing games. They also become familiar with what it means to be a student mathematician and learn about their speaker, listener and speaker roles. Chapter 2 helps students learn about patterns with skip counting using the Hundreds and 200s charts. They learn how skip counting relates to place value when counting by 10s to any number. They play games focused on an understanding of place value in two-digit numbers, addition and estimating sums. Chapter 3 provides students with an opportunity to focus on classifying numbers using logical reasoning. Students learn about even and odd numbers and use this information along with their knowledge of place value and greater than/less than to sort numbers in a Carroll diagram. They also use this information along with their knowledge of skip counting patterns to play games with Venn diagrams to further develop their logical reasoning using all the concepts learned in the unit. Throughout the unit, students are helping Imi and Zani as they create and test out different number games for students around the world to play. Students develop mathematical reasoning and learn to communicate effectively both orally and in writing.